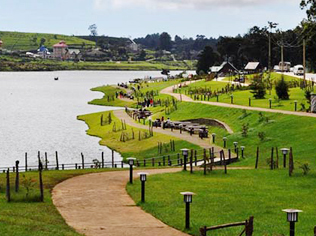 Nuwara Eliya meaning "city on the plain (table land)" or "city of light", is a town in Sri Lanka. It is located at an altitude of 1,868 m (6,128 ft) in the central highlands and is considered one of the most important locations for Tea production in Sri Lanka. The town is overlooked by Pidurutalagala, the highest mountain in Sri Lanka. Ritigala nestles deep inside the Ritigala Strict Nature Reserve, found just off the Anuradhapura-Habarana road, and is the partially excavated ruins of an extensive Buddhist Monastery. It was abandoned following invasions in 10th and 11th centuries and today holds special appeal with its curious blend of nano-safari and archaeology. Walking around the beautiful ruins does certainly give you a feeling of adventures in search of mythical pasts; it is easy to imagine yourself as Indiana Jones whilst clambering over the overgrown relics of a forgotten time. A park premeditated with offering protection for the herd of elephant witnessed sometimes over 250 during the migration season, Kaudulla National Park provides a measure of protection not just for that single species, but for a host of others such as many mammals, birds and reptiles all scaled or feathered, leafy or hairy. Located 190 kilometers from the capital city of Colombo it can be accessed through Habarana Trincomalee road from the Gal Oya junction which is only 6 kilometers from the Park. The Kudulla National Park plays a vital role in the region’s planned wild life protection which clearly stands attest the protection of bountiful natural heritage not just for survival but also to flourish for the future generations. Located between Wasgamuwa National Park and Minneriya National Park this 6656 hectare conservations include semi mixed evergreen grass lands and riverside forests as well. Known for the flamboyant array of aquatic birds such as cormorants, painted storks and others, which attracts photographers from around the region, the wetlands of Kudulla Park is also home for fishing cats, sambar deer, the endangered rusty spotted cat, sloth bear and even at times leopards. Known as the second largest park for herds of wild elephants, the Udawalawa National Park lies in the lower catchment of Udawalawa Reservoir in the country’s Intermediate Lowland region it was established as a National Park on 30th July 1972. It This area falls into two administrative districts in two provinces. The parkland on the right bank of Walawe ganga is within Ratnapura district in the province of Sabaragamuwa and the parkland on the left bank falls within Moneragala district in the province of Uva. The dry land area of the Park is about approximately 28910 hectare. The reservoir of Udawalawa is surrounded by open plains and foothills such as kalthota Escarpment and spectacular Diyawinne Fallto the north and Ulgala, in the west. The climate in the park is characterized by a seasonal rainfall and uniformly high temperature conditions. A short dry spell is experienced in February- March and a prolonged dry period is observed from mid May to end of September. 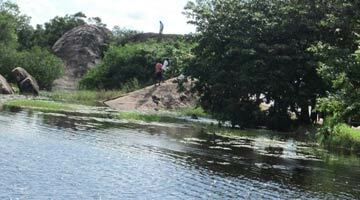 Declared a strict natural reserve as way back as in 1938, Wasgomuwa was elevated to the level of a National Park in 1984. Situated 260 kilometers from Colombo, the park occupies areas of the North Central and Central provinces with a total land area of 39,000 hectares. The park consists mostly of Riverine Forest, Grasslands and Wetlands encompassing many different habitats for its inhabitants. The park is almost entirely surrounded by the Maheweli and Amban Rivers. Wasgomuwa is famous elephant country and has a reputation for having less habituated pachyderms than most other parks. 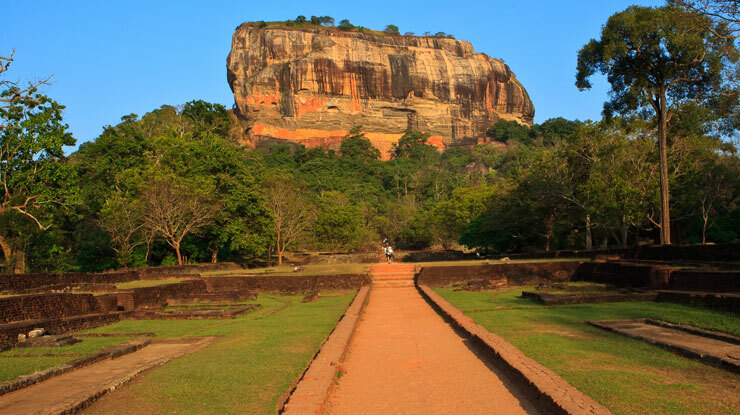 Wasgomuwa is one of the least visited and most un-spoilt of Sri Lanka’s national parks. Established in 1984 to protect wildlife displaced by forest clearance, this park is enclosed and protected by two mighty rivers which flank its borders: the Amban Ganga to the east and The Mahaweli Ganga to the west. Located about 16km inland to the west of Potuvil is the 1554 hectare Lahugala Kitulana National Park. The Pottuvil-Monaragala trunk road runs through the south-eastern sector of the park. It is 2 km off the main Monaragala – Pottuvil road some 5 km from Pottuvil. 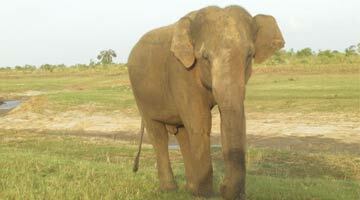 The park lies between larger wildlife reserves of Gal Oya National Park to the north and Ruhuna Yala National Park to the south, the Lahugala park is part of the protected ‘Elephant Corridor’ for the elephant population to move freely across the south-eastern part of the island initiated by the Governments as part of its nature and wild life conservation project. The Lahugala Park was primarily declared as a sanctuary on 1st July 1966 which was later upgraded as a National park on 1st October 1980. Although considered as the smallest national parks in the country, the Lahugala Park is a popular location for elephant enthusiasts and bird watchers. The main reason for the large attraction of elephant herds in this park is contributed to the presence of the beru grass, which grows in the pastures around the main three tanks in the park. With the arrival of rain in October, most of the herds of elephants drift back to their regular haunts. 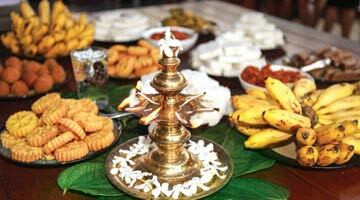 Located between Belihui Oya and Wellimada is Haputale, a small town perched steeply on both sides of a sharp ridge at the southern edge of Sri Lanka’s flamboyant scenic hill country. 122 kilometers from the capital of Colombo Haputale could be reached by train in 9 to hours whilst public bus or hired transport will yake an hour less to reach this panoramic small town. Haputale is renowned, like so many other hill towns on the island, for its spectacular views. While you travel make sure to turn off the air conditioner and grab a window seating to feast your eyes on magnificent waterfalls looming mountain ranges and the misty breeze that will gently blow on to your face as you experience the temperature decreasing as you near you destination. One of the most disconcerting is obtained from the main street, which seems to disappear into thin air, although in reality it just makes a right turn. On a clear day you can see from this ridge all the way to the south coast, and at night the Hambantota lighthouse situated at the Southern coastal areas of Sri Lanka could also be sited. The Diyaluma Falls is a 220-metre high waterfall on the Punagala Oya located very close to the A4 road between Koslanda and Wellawaya. The Punagala Oya rises from the Mahakande pass and flows into he Kuda Oya, a tributary of the Kirindi Ganga, which flows into the sea near Tissamaharama. The Diyaluma Falls, the second highest in Sri Lanka, is the last of a series of waterfalls on this river. Copyright © 2017 Helanka Vacations All Rights Reserved.